Green gram / cherupayar is my family favorite which is also known as mung bean / moon bean. We can make both sweet and savory dishes with this green gram. As being from kerala, Cherupayar kichdi and cherupayar payasam is my favorite green gram recipes for desserts. 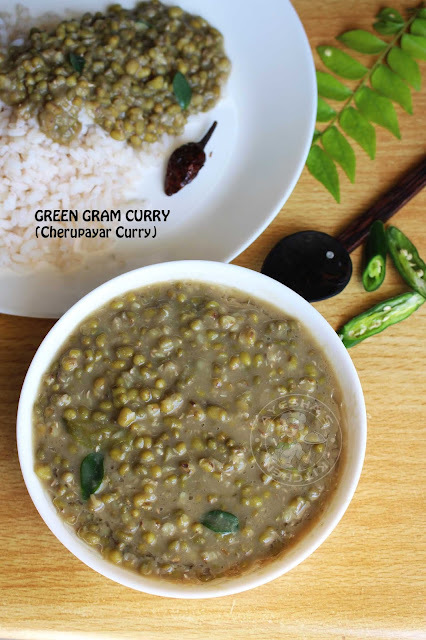 Today am here to share a special green gram curry / cherupayar curry that tastes heavenly delicious along with steamed rice. You can also make sundal, yet another savory dish with green gram. For payasam and kichdi, moong bean without skin is used. Here is my recipe showing how to make cherupayar curry / green gram recipes / green gram curry/ healthy recipes/ side dish for chapati/ school days cherupayar curry/ cherupayar kanji/ kerala style cherupayar curry for rice. Soak green gram (cherupayar) in lots of water for 4 hours or overnight. Now wash it thoroughly and then drain the water. Add this soaked green gram (cherupayar) into the pressure cooker along water (around 1.5 cups) and green chilies. (do not add salt now). Pressure cook it for 3 whistles . When done, you can see the green gram gets slightly mashed up. Now add salt and again cook for another 5 minutes. If it looks more thick, then add some hot water (do not add more). Finally pour a tablespoon of coconut oil (very important) over it. Mix well and close the lid. Remove from flame. 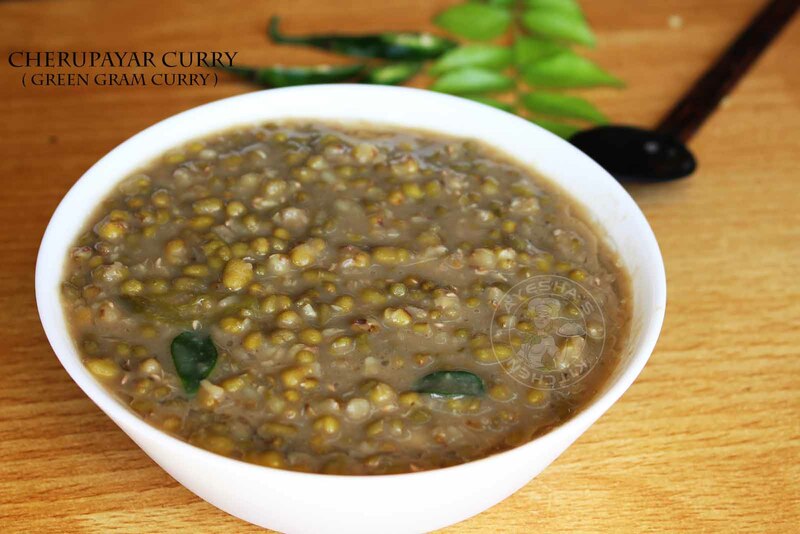 This delicious green gram curry is my native special curry recipe (Malappuram dt, Kerala).